The ocean floor shifted sideways by 79 feet in the Japanese earthquake in March - much further than scientists originally predicted. And researchers are warning that immense amounts of seismic stress remain stored in the area, putting it at risk of further devastating earthquakes. The journal Science has published three new papers about the effects and causes of Japan's March 11 mega-quake, which paints a picture of an earthquake hot spot much more complex and potentially dangerous than scientists had ever anticipated. In one paper, the Japanese Coast Guard has released data from five geodetic instruments that in 2000-04 they had placed underwater along the fault line responsible for the colossal quake. One of the instruments had actually been placed almost on top of the epicentre of the Magnitude 9.0 quake, at a station called MYGI. Measurements taken in the week following the earthquake showed that at the MYGI site, the sea floor had moved about 79 feet to the east-southeast since the previous measurement in February. It had also risen about 10 feet. Dr Mariko Sato, a geodesist with the Japan Coast Guard in Tokyo, believes almost all this movement happened during the quake. 'The scale is almost double that estimated only from the terrestrial data,' Dr Sato told BBC News. Under the seabed, the movement may have been even greater - perhaps 160 to 200 feet, by some estimates. In another study sure to raise alarm in Japan, scientists from the California Institute of Technology have reconstructed how the Tohuku-Oki earthquake unfolded using GPS data recorded at more than 1,200 sites. Their data showed that - contrary to previous opinion - the area had built up massive amounts of strain prior to the earthquake. Earlier, there had been general agreement among researchers that the 'Miyagi segment' of the fault line was not under the stress of other segments along the Japan plate boundary, where large earthquakes occur at a regular basis. But Professor Mark Simons' team showed that this assumption was deeply flawed. This raises questions about other sections of the fault line that had previously been considered low risk - including areas further south, closer to Tokyo. This 'Ibaraki segment' of the plate boundary has been thought to behave in similar fashion to that of the Miyagi segment, and Professor Simons says it may likewise hold large amounts of seismic stress. In recorded history, this southern area has experienced only one set of quakes larger than magnitude 8 - which means the region could be ripe for its own rupture. The quake may also have destablised nearby areas of fault line, making them even more vulnerable to a catastrophic rupture. 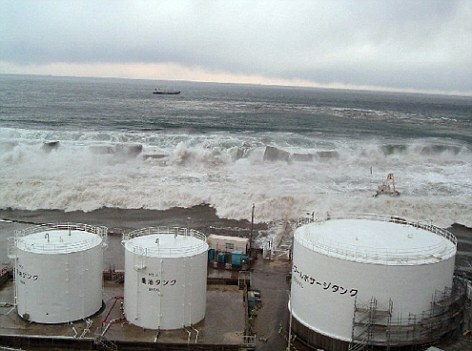 The earthquake and subsequent tsunami left more than 24,000 people dead or missing, and wiped out entire towns.